I hope the holidays have been nice/continue to be so for you. 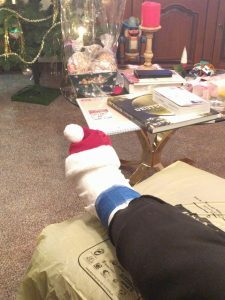 Unfortunately, I managed to injure my foot last week-end, and it’ll need to be operated on. I’ll go into surgery tomorrow (28th of Dec), and it may take a few days until I’m back in office and capable of writing reviews. I hope you’ll understand! I wish you all a great last couple of days of 2018! Need some last minute holiday module recommendation? Here are a couple of my all-time favorites, in no particular order! Released the review of the revised edition today. Cool dark fantasy/folklore scenario with replay value. Only available for a brief period of time! Puzzles, high stakes, mystery – this one has it all! I’ve just released my review of it, so consult it below for details! You can get this module here! This one is an underdog, but I really, really like it. The nastiest evil-Santa scenario I know! If you want horror, this delivers in spades! You can get these cool two modules here! A class of its own, this epic mega-adventure stands singularly as a truly massive masterpiece. For PFRPG, there is no way past this one! I wish all of you out there wonderful holidays! This module clocks in at 42 pages, 1 page front cover, 1 page editorial, ½ a page SRD, 1 page back cover, leaving us with 38.5 pages of content, though it should be noted that the content is laid out in booklet format (6’’ by 9’’/A5), and this means that you can theoretically fit multiple pages on a given sheet of paper. This review is part of a request of one of my patreon supporters, who requested it to be undertaken at my convenience. Okay, first things first: In spite of the cover being as cutesy as DCC is probably going to get, this is not necessarily for kids – it is definitely intended for adults. Don’t get me wrong: I’d have loved this as a kid, but then again, I taught myself English to be able to read Conan, Poe, etc. ; I always had a macabre streak and considered to be the cover of Bat out of Hell’s vinyl one of the coolest ever. While not grimdark, this module *can* be rather creepy. Discretion is advised. If your kids are how I was…well, then they may love this. All right, as always, a well-rounded group of 6-8 characters (level 2, here) will have an easier time. I strongly recommend having multiple characters capable of spell dueling when playing this; if you want a happy end, Mighty Deeds do help. Read aloud text is provided, and the module is NOT easy. Characters may die. It also firmly emphasizes player-skill and can have rather high-impact consequences upon failure. The module is set in Vajorma, the frigid north where the border between planes is thin…wait…sounds familiar? Well, yeah, this does have a couple of ties to Steve Bean Games’ “World-Quest of the Winter Calendar” (Review will hit sites before New Year’s Eve, as that module feels more like an end-of-year module to me.). You can ignore these easter eggs, and having played said module is not required to enjoy this. All right, as always, the following contains SPOILERS for the module. Potential players will want to skip ahead to the conclusion. Okay, so, in the lands of Vajorma, there is a tradition that reminded me of the nisse from Scandinavian cultures: There are gnomes called Konhengen in the semi-arctic steppe, and said gnomes reward particularly virtuous kids with presents. Now, 3 kids have gone missing, and indeed, no presents have been delivered this year. What looked like innocent gifts and a simple rescue mission, though, quickly become immensely important. There is actually a strict timeline in the module, and indeed, the PCs arriving at the lake that houses the mountain wherein the Konhengen dwell just heralds the shape of things to come. There are a couple of basic things to note: For one, the PCs will be attacked by scything topiaries – think of those as nasty plant-looking constructs. The exploration of the Aerie of the Konhengen is surprisingly vertical – 5 levels, and these make sense in many ways: For one, the halls may feel claustrophobic for Medium-sized characters, but for the gnomes, they sure as hell are grand – this gives the whole dungeon a Gulliver-ish vibe and established a sense of alienation. The fact that the gnomes use slugs and moles as animals also adds to that…and yes, chances are that the PCs will have to face a rather agitated slug at one point. As a whole, this place makes sense in its fantastic nature. It should come as no surprise that something bad has befallen the kind gnomes: As the PCs explore this place, they will be haunted and hunted by so-called Desperate Phantoplasms – basically the spirits of the slain Konhengen, risen to guard this place against ALL intruders – including the PCs. Their semi-corporeal form means that a lapse in vigilance can justify surprise assaults, and in comparison for the level…these spirits are pretty pitiful. There is a reason for that. You see, they can’t be truly slain. Defeating one of these ultimately just initiates a cooldown respawn, which means that being able to swiftly dispatch them is crucial. They allow a judge to wage a war of attrition, to constantly keep the threat levels up – without overpowering the PCs. This generates a seriously impressive tension throughout the adventure, and it provides a great way to shake up proceedings if the PCs are stuck. 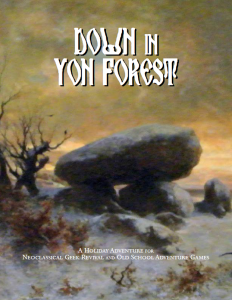 Speaking of which: The pdf provides a commendable amount of guidance pertaining the handling the tougher sections of the adventure…and I have not yet touched upon the truth of what has befallen this place. Sure, the PCs can find a unique and potent alchemical substance and use it to their own advantage (or blow themselves up – so it goes…), and they can save the aforementioned kids. Speaking of which: I’m a big fan of the choice to allow for e.g. Mighty Deed use to save them from attacks and the like. A kind judge may also use these kids to sprinkle in some hints and the like, but there is another primary hint-giver herein…one super-creepy fellow. You see, as the PCs explore this place, they will notice that much of the carnage to be found stemmed from the disciplined Konhengen basically imploding their social structure. Co-workers tore each other apart, etc. This is due to the machinations of one of the dread Nine Afflictions, horrid demon-like demigods of evil and chaos, one Yedreksas – an incarnation of envy. They have inadvertently stumbled upon a task of cosmic significance, as at the very latest, the unfortunately blind, but sentient and kind mill (!!!) (think of the handheld devices that you use to grind coffee!) can explain…at least partially. And beyond that, one particular former Konhengen is now a vile and dark being, trying to goad the PCs in engaging in as many deals as possible. We thus have plenty of options to provide hints. The PCs will need them. You see, the presents crafted by the Konhengen? They are actually over-designed components, prototypes of sorts, granted to pure kids, as their virtue shields these from the forces of darkness. Literally, this time around. Kivas Kota, the fiery eagle that is the sun, annually is caught by the forces of death, and it’s only the work of the Konhengen that allows the sun-bird to rise again and stave off eternal darkness. The presents the Konhengen create are prototypes for basically what amounts to a celestial rube-goldberg machine of constellations that is annually recreated for this specific task! (!!!) If the PCs don’t make their own version, well then the sun will never rise again. Stakes high enough for you? Here is the best thing about this module, though: How it presents this whole issue. You see, the PCs are not spoonfed any of this, but instead have a TON of different options to realize how this works and what’s at stake. This is basically a mystery investigation, and one that is supported in a phenomenal manner: There are no less than 7 (!!!!!) handouts for players: From blood-drenched parchments containing hints about the importance of the task to basically rune-based paint-by-numbers puzzles, this pdf pulls out all stops in the most amazing of ways. Even better yet, judges are not left hanging either – annotated explanations of texts to be interpreted, solution-sheets and more all conspire to make this a mega-impressive adventure in the aesthetics department. Better yet: The adventure, while focused on a puzzle, actually doesn’t put it front and center. Instead, the true challenge is to find out what is happening, and there are myriad ways to solve this. Moreover, the puzzle does not have just one solution – being a wide-open logic puzzle, it embraces PC creativity in a manner that I have not seen before. Compared to that, the epic milling of a new set of temporary constellations while holding off a demigod in spell duel (the only truly viable means to do so) almost feel anticlimactic by comparison. Almost. Did I mention the wood-spider things? Editing and formatting are top-notch, I noticed no issues on a rules-language or formal level. Layout adheres to a 1-column b/w-standard, and the pdf sports some really cool b/w-artworks. The cartography is b/w, plentiful, ad just as amazing as we’ve come to expect from Goodman Games. Alas, no player-friendly versions are provided. The pdf version is fully bookmarked, and I unfortunately do not own the print version, so I can’t comment on its merits or lack thereof. The truly plentiful player-handouts and visual judge-reference sheets (which include a timetable) are utterly amazing. Steve Bean’s “Trials of the Toy Makers” is a masterpiece, pure and simple. It is one of the best Christmas-themed adventures I have ever seen. It thoroughly rewards player skill over character skill, has an atmosphere that is absolutely fantastic, and presents one of the most intriguing conundrums and epic solutions for an adventure I have ever seen. Even in DCC’s context, where significant cosmic events can also be encountered at lower levels, this stands out. It brims with creativity and passion and feels like an honest labor of love. It is ambitious in more than one aspect, and manages to fully and properly realize all of these components. In short: This is one of the best Christmas modules out there. It engages more cerebral players and those that like combat; it’s environmental storytelling is excellent, and it is polished to an impressive degree. Even among Goodman games’ holiday-themed adventures, this stands out. 5 stars + seal of approval, and frankly, if I had known about this adventure in 2014 when it was first released, it’d have made my top ten list for that year. Yes. That good. This is the kind of gem that makes reviewing worthwhile. You can get this inspired adventure here on OBS! Disclaimer: While I have joined Legendary Games as lead developer, I have no stake in this product. It was created prior to me joining the team, and it was provided with the intent of getting the usual fair and harsh treatment. I was not involved in the creation of this product in any shape, way or form, and I have nothing to gain from this review. See what I meant regarding the fact that these resonate with real life mythology? For a bit of madness, you can have the blood rage universal monster ability; you can have a frozen heart…and there are some that are downright genius. Rhymer’s truth would be one of these: This bargain strips you of the ability to lie. If you utter a factual statement that *may* be true, you have a pretty high chance that you can’t finish the sentence. This is frickin’ intrigue gold. If you pay with your shadow, you can make your kingdom (yep, kingdom-building synergy included!) help recover hit points from resting and magical healing! 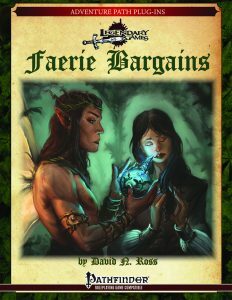 It also improves the benefits of holiday edicts and settlement stats are improved…but the faerie does get a pretty potent ability…namely to assume your form! Once more, the potential is amazing. And yes, there are multiple such bargains included. Editing and formatting are very good on a formal and rules-language level. Layout adheres to the nice two-column full-color standard of the Kingmaker-plugins, and the pdf features a blend of previously used and new full-color artwork. The pdf comes fully bookmarked for your convenience. You can get this glorious supplement here on OBS! You can get the whole compendium of Kingmaker plugins here on OBS! All right, since my last post, I’ve had a stimulating decision with some of my readers, namely, Delurm and Keith Davies. At this point I’d like to thank them! During the course of this discussion, the notion of segmented spellcasting came up. For the young ones: You’d start casting, and the more powerful the spell was, the longer it’d take for the casting to be completed. It’s an often forgotten component of earlier editions of the game, and it is one of the more charming components, at least in my opinion. An automatic component of implementing segmented spellcasting would be that the lower level spells remain tactically relevant, that casters, and other characters, by playing with their initiative and choosing spells in a smart manner, could interrupt each other and face off on a tactical level. The concept is easy to implement and explain. 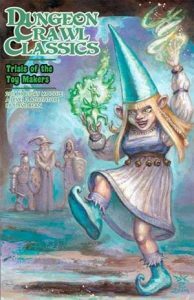 You can obviously tweak this system in a variety of ways, but its implementation in either could really help spontaneous spellcasters to stand out more, and as an aside, metamagic could be made more relevant that way as well. The sorcerer could have a mechanically-distinct niche! Another key point that was mentioned, would be that, at one point, learning a spell was tougher, and that chances for saving throw success actually improved at higher levels…which made particularly martial characters rather frightful, damn tough cookie to cast to shreds. Looking to old-school, and a particular wording ambiguity in the German iteration of AD&D 1e, I recalled an interpretation where the percentile check to determine spells that can be learned..kinda would make sense today as well. When playing with this system, you automatically arrive at a more diversified spell-loadout. Some casters never managed to learn that fireball, so other spells needed to be developed…Of course, in a contemporary iteration, rerolls on new levels or auto-learn of lower level spells would make sense, but the core appeal of this limitation remains. While on the subject of old-school design decisions that are interesting: Personally, I’d very much adore a (optional) houserule that would present carousing rules, or one that contextualized XP with something tangible in-game, be it gold or the like. The latter also would take care of WBL issues on its own…but I digress. Now, as for design space and the discussion of my least favorite, and my most favorite aspects of the game. As far as least favorite is concerned, that’d be the exceedingly pronounced focus on feats for everything modular. Granted, PF 1 allowed for feats to grant access to class features – but only in a limited manner. In a way, the particularization shows here is also one aspect whose consequences we can observe in SFRPG. In that game, archetypes are, in case you didn’t know, applied generally – each class can take an archetype. This presents a challenge for the designer – the archetype must or should work with a plethora of classes, which, by necessity, makes the abilities either a system grafted onto the base class, or a modification that is not enough to unhinge the power-level of any class. In PF Playtest, this can also be seen in some feat categories. However, most class features have similarly been made into class-specific feats. An issue here would be the illusion of parity: One class feat is worth as much as the next right? Well, not really, but that is a question of finetuning. More problematic would be that all larger conceptual packages, the ones we usually considered to be archetype packages, can be split down. One of the strengths as far as character design in PF 1 is concerned, is the supreme array of options it provides for players: From the tiny trait to the feat(s) to the archetypes, there are a ton of considerations, both big and small. One of the most prevalent gripes I have heard against 5e, is that many classes don’t have enough choice until 3rd level. As a consequence, I very much believe that all classes in PF Playtest should have at least one class-relevant choice to make at first level. As far as archetypes are concerned, their function is interesting: They allow the player to take components of the experience of the vanilla class away and replace them with something different. The sheer size of an archetype also is one strength: You could justify a stronger ability for the loss or crippling of another, allowing for a huge field of design space. At the time of me writing this, I can primarily see….feats. Endless oceans of feats. These *can* and probably will, yield similar options, sure – but considering that these feats are intended to have equal value, we either arrive at feat taxes in linear sequences…or can no longer justify incisions of this extent within the system provided. Sure, one could generate chain-feats that unlock a linear sequence of abilities, but lock multiple feat slots upon taking them, or introduce forbiddance-clauses (can’t take feat x and feat z), but ultimately, I don’t think the game would benefit from these, and they wouldn’t change the fact that the core of the class would remain untouched. If I could have my way, I’d suggest including both PF 1archetypes (for concepts tied to specific classes) and SF-style archetypes for more general ones. So that would be definitely an important design space one should carefully consider. My favorite aspect of PF Playtest? By far? How gloriously concise it defines the tactical actions. Aid, assist….and particularly Interact. One of the biggest issues with dynamic and interesting combat areas in PF 1 is the relative fiat-based use of actions that are not “I hit it with my sword/spellcasting/killing stuff.” It is testament to how engrossing PF 1’s combat can be that I never realized it until I started regularly looking into other games. One mechanism can be a standard action to activate, one could be a full-round action – etc. There was no simple and unified baseline for many of the aspects that would allow for the roleplaying/smart playing in combat, at least beyond immediate combat tactics. PF Playtest handles this perfectly, by providing easy to reference defaults, including “Interact.” Combined with how movement in combat works in PF Playtest, I do think that the new system will be conductive to much more interesting combats and situations. Particularly in module design, this base system, actions like Seek etc., allow even now for a ridiculous tactical depth beyond the confines on killing enemies. Combat puzzles, running battles, etc. – there are so many scenarios that will run smoother with this. In a way, this will probably be a bit of a challenge for many PF 1 authors, as the engine now basically demands clever use of terrain. I love this aspect of the game, as it REALLY drives home that there will be no excuses. I fully expect this simple and underappreciated base-line to greatly enhance the diversity of challenges posed in PF 2 adventures. When implemented properly, this could allow for more diverse roleplaying and offer some of the depth of the like often found in old-school systems, all while not compromising the integrity of the tactical combat, rather enhancing that aspect. So yeah, this very much represents, in and of its own, an excellent reason to be stoked about the game to come, at least as far as I’m concerned! It may also be an indicator that PF 2 is expected to move a bit away from the focus on PC options and towards individual classes/terrain etc. mattering more and becoming more diversified, but I am just speculating at this point. …and honestly, that’s it about for now. I am pretty optimistic about the future of the system as a whole, and I do believe that it can become something rather special. Right now, there are a couple of aspects I’m not yet 100% keen on, but ultimately, we’ll have to see how the system develops and how the entirety of the finished experience will work out. 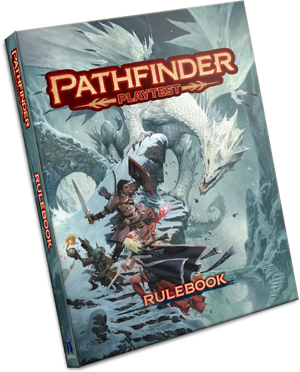 After all, Pathfinder’s Core book alone did not establish the aesthetic on its own, either. If you enjoy my reviews and posts, please contemplate supporting my patreon. It keeps this site alive. This module clocks in at 32 pages, 1 page front cover, 1 page editorial, 1 page blank, 1 page back cover, leaving us with 28 pages, so let’s take a look! Wait, before we do, a couple of notes: One, this adventure sports stats for both NGR (Neoclassical Geek Revival) and general OSR-stats that provide basic analogues for AC, HD, etc. ; if you have the choice, I’d suggest using the NGR-versions. Like the more recent of Zzarchov’s adventures, this one comes color-coded: I.e. orange text indicates hidden danger, red indicates overt danger, blue the most obvious detail, and green treasure. Now, why did I move this ahead in my reviewing queue? Well, I have covered it last year, and since then, it has seen a rerelease in print in the author’s limited edition Adventure Omnibus, which was enough for me to reread and revisit it. It should be noted that this module is only seasonally available. You can get this adventure only for a very brief timeframe: At the 25th of December, it will once again vanish into the ether for a whole year. So yeah, if you are interested in this, you need to act fast! Now, in case you were wondering: This is not a happy-go-lucky Christmas adventure; it sports the rather dark and dry humor of the author, so yeah – not recommended for kids. This out of the way, let us dive into the details! From here on out, ladies and gentlemen, the SPOILERS will reign. Potential players should jump to the conclusion. So, the threat is, basically, that Krampus will take all the children…so what to do? Well, breaking off crosses at the cemetery may be smart (blessed, they can hurt the entity…) and there are a couple of additional complications: A child-eating, horribly deformed witch living in an abandoned mill is one issue; convincing some hussars that the old tale is real may be nigh impossible, but hey, worth a try, right? Islands that house perchten (beast-men) and random tables for the ice-covered wilderness are included – and yes, they are as interesting as we’ve come to expect from the author! The PCs can attempt to delay Krampus; while the entity is too strong to properly defeat (unless they are really lucky), delaying tactics may well work. A breakdown of individual strategies is provided, including countermeasures taken, etc. There is also a fortress, abandoned due to plague and now infested with powerful gargoyles, which may yet act as holy ground, holding the entity at bay – but convincing the townsfolk to go there, even if the fully mapped place is cleared, may be tough. Cool, btw. : From the bodies of defeated foes, new magics may be unearthed (when using NGR rules), while two grimoires may be found – one is btw. the book of moderate darkness. This dry humor also extends to the magic items – there are several items devoted to the Winter King’s rites, including everlasting cakes. The formal criteria have VASTLY improved anno 2018! Editing and formatting are tighter than before; Layout adheres to a two-column b/w-standard and is professional and smooth…and the pdf now sports kickass Alex Mayo illustrations! The cartography by none other than Dyson Logos is b/w and smooth, and it has also benefited from the overhaul: We do now get a player-friendly map of the village! This is a big plus. My one gripe on a formal level: The pdf, alas, has no bookmarks – if you get this, make sure to print it for easier navigation. I ended up enjoying Zzarchov Kowolski’s pagan holiday adventure; it is a dark yarn set in an age of ignorance. 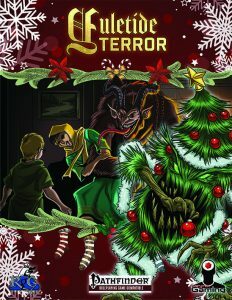 There is serious fun to be had here – though it should be noted that this is not necessarily a Christmas module in spirit; instead, we have a dark fantasy/horror yarn that makes use of Christmas tropes, but that becomes very much its own thing. I most certainly consider it to be fun, if not a module I’d play to get into the holiday spirit. 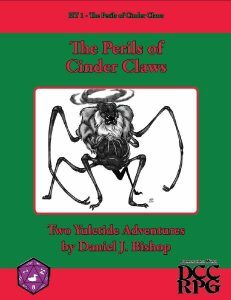 Then again, if you’re like me and have…problems with the holidays, some sort of baggage and want a module that fits the season without hearkening too close to the things we associate with the holidays nowadays, if you want a dry, dark critique on the season, then this is pretty much perfect. Now, I really enjoyed this module, due to completely different reasons than most Christmas modules; because it is kind of anti, but without resorting to a full-blown inversion or spitefulness; it is a tale of the holidays in a world, where the meaning behind such a celebration may well spell the difference between life and death.The revised edition anno 2018 has significantly improved production values, and as such, the rating obviously has to reflect that. While the lack of bookmarks represents a comfort-detriment, I whole-heartedly recommend this adventure to fans of dark fantasy. My final verdict for the revised edition will clock in at 4.5 stars, rounded up for the purpose of this platform. And due to the massive replay-value, this also receives my seal of approval. You can get this module, only until the 25th of December, here on OBS! This Everyman Mini clocks in at 11 pages, 1 page front cover, 1 page editorial, 5 pages of SRD, leaving us with 4 pages of content, so let’s take a look! 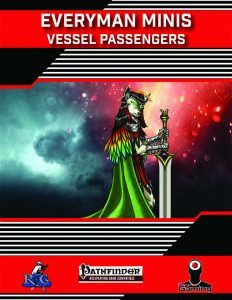 First of all: In case you didn’t know: This pdf is an expansion for the vessel class that was originally presented in Paranormal Adventures, itself a love letter to the Supernatural franchise and Occult Adventures’ design-paradigms. The class could be best summed up as: “Do you want to play Castiel, but retain control of your faculties?”-the class. Alternatively, if you had no idea what that sentence meant, one could consider the vessel to be basically a medium-style character in theme. No, it has nothing in common with Paizo’s medium class – the vessel has a specific bond with a powerful outsider and may be ridden in a way. Think more of a permanent Loa, a fusion with a devil, etc. From Spawn to similar classics, the vessel has a lot of potential and radically different ways to express the unique class. Passengers, unsurprisingly, are an important and pretty much essential component for the class, which, in impact, could be likened in severity of impact, to a bloodline or an order, perhaps even beyond that. I assume general familiarity with the vessel class in the following review. But before we take a look at the new passengers herein, we should acknowledge the new feat that is included on the introductory page: Life to Grace. Grace, the vessel’s point-based resource, can be gained here via a unique mechanic – upon gaining the feat, the GM rolls maximum age in secret, and when you’d need to spend grace, you can reduce your maximum starting age by a number of years equal to the race’s trained starting age modifier to reduce the total grace costs by 1, to a minimum of 0. Basically, you sacrifice years of your lifespan to fuel your abilities. This is a stroke of genius – races have wildly diverging lifespans, and tying this mechanic to trained starting age accounts for that. Now, sure, mathematically, there will be differences, but if you have millennia ahead, wouldn’t you be extra careful with this one? This aging process also can explicitly only be reversed by divine intervention, and before you ask: Immortal or non-living creatures are explicitly prohibited from taking this one. I love this and the only super-specific nitpick I could field here, would be that samsarans should be prevented from taking the feat…but that is an aesthetic choice. One could argue that rebirth is a death, after all, and depending on how nonchalant or serious you take the concept, this may never be a true issue. All in all, I adore this feat to bits, and its mechanics can easily be used to create derivative feats or class features that literally burn away lifespan to power other resources. One of the coolest feats I’ve seen in a while! There are three vessel passengers contained within the pdf: Fey spirits get DR/cold iron, are associated with magic, plant and Weather as far as domains are concerned, and the boons include selective SR that scales, woodland stride and enhanced speed. The passenger also provides scaling options to call fey, akin to a summoners’ summon monster ability. Higher levels provide the means to use grace to become invisible as per invisibility, and fey forms that improve at higher levels, culminating in fey apotheosis and constant mind blank at 18th level. The second passenger would be the shinigami, who requires LG, LN or LE alignment, is associated with the Death, Healing and Repose domains, and the DR is /chaotic and silver. Vessels stop aging (but remain susceptible to aging effects) and gain a bonus to saves vs. death, poison, cold and disease. On the passive benefits side, we get fire resistance 5 (10 at 15th level) and scaling SR. 6th level provides grace-powered fast healing and gains cure spells and breath of life as spells known, with the former being optionally powered by grace expenditure. Frightful presence, deathsense – some cool tricks. At 15th level, natural 20-based crits can add negative levels onto targets, potentially affecting the vessel with heal for more grace. Kudos for making this proof against attempts to cheese it! The final ability adds some potent immunities as well as grace-powered casting of death-themed spells to the passenger. The third of the passengers would be titans, with alignment restrictions based on the titan subrace in question. Similarly, associated domains are contingent of the specific titan subtype chosen. This modularity also extends to the damage types to bypass DR. As far as grace boons are concerned, we have save bonuses that scale, SR versus outsider spells and SPs and later, some immunities: Minor nitpick: The ability name hasn’t been properly italicized, which represents a purely cosmetic snafu. The passenger nets rock throwing and catching, and 9th level nets righteous might (not italicized properly in one instance) as a grace-powered SP, with DR adjusted for the titan subrace, and it later improves to also feature air walk and trample! Grace-powered heal (again, not italicized) and size-increases for grace are cool. The high level ability, among other things, “stios aging” – it’s odd how this last passenger has accumulated these typos. They don’t wreck it, but I couldn’t help but notice them. Editing and formatting are very good on a rules-language level. On a formal level, formatting and editing are slightly less tight. Layout adheres to the two-column full-color standard of the series, and the piece of artwork presented is nice. The pdf has no bookmarks, but needs none at this length. David N. Ross knows what he’s doing. His pdfs range rather often among the highest echelons of my rating system, and indeed, his passengers are amazing. While I would have loved some more Death note-y abilities for the shinigami, it’s close enough to make me smile. Similarly, the titan…is relevant for fans of a franchise that features these guys in a prominent manner. The feat, imho, is a stroke of genius, and its design paradigms will influence my own home-game. While the uncommon accumulation of minor formatting glitches in the last vessel is slightly jarring, I will still round up from my final verdict of 4.5 stars, and the feat’s cool angle single-handedly nets this my seal of approval. It’s not a feat for every game, but I love it to bits! Missed the Vessel class? You can get Paranormal Adventures here on OBS! Now, just to spell that out explicitly: This supplement obviously makes use of Everyman Gaming’s Microsized Adventures. This phenomenal supplement made my Top Ten list for a reason and is one of the truly beloved components in my GM-arsenal. This supplement, then, presents three creatures that allow a GM to temporarily microsize the PCs without requiring much set-up. The pdf does warn that application of the Microsize rules can make e.g. a housecat or a budgie a lethal threat to the PCs and advises caution, but it should be noted that the monsters their CR-ranges make them ttough, but no TPK-engines. The Tiny dwindling adder is a CR 7 magical beast that goes another route: They can compress in a defensive manner as though affected by reduce person, becoming Fine (and then still have compression while Fine!) – and they have a poison that shrinks targets! Effects are cumulative, the poison has a GP-value, etc. – really cool one! For lower CRs, we have, finally, the Tiny CR 3 miniaturizing mimic, who can assume the forms of Tiny objects, obviously, but who can also emit a mesmerizing melody that affects those nearby with the shrinking curse usually transmitted by bite. As a cool bonus, we get a new bardic masterpiece for Unchained Bards – the Song of Diminishment, which is impressive in that it allows for multiple size reductions, but also manages to get the rules-interactions of maintaining them right. A cap also prevents undue cheesing. It should be noted that unchained bardic masterpieces work differently than default bardic masterpieces, though…so if you haven’t checked out the unchained bard, this may be a good reason to do so! Editing and formatting are top-notch, I noticed no hiccups on a formal or rules-language level. Layout adheres to the two-column full-color standard of the series, and the artwork presented is pretty damn cool. That being said, apart from the cover-artwork, there is no individual illustration of the monsters themselves. Personally, I didn’t mind – I’m a substance over style kind of guy. The pdf has no bookmarks, but needs none at this length. Matt Morris? Microsized critters are cool, allow for quick and flexible use of the amazing microsizing rules, and not one of them is boring. The magical beast feels like a magical animal, the outsider like something weird – you get the idea. This is a damn fine little critter-booklet. As such, my final verdict will clock in at 5 stars. 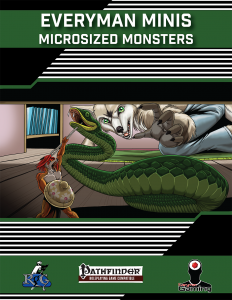 You can get the phenomenal Microsized Adventures here on OBS! The convenient templates for quicker size changes (particularly helpful, if you really want to go full-blown Wonderland…) can be found here! Aforementioned unchained bard can be found here! This Everyman Mini clocks in at 8 pages, 1 page front cover, 1 page editorial, 3 pages of SRD, leaving us with 3 pages of content, so let’s take a look! Somewhere between the Plane of Dreams, the Shadow Plane and our mortal realms, there lies a place that we all can remember from our childhoods: The realm beyond the streets, beyond the bed, beyond the walls of the closet – the Underverse, a place where nature is not fixed, a place that can be equal parts Neverland or Nightmare realm. Time is erratic, and entryways and exits are ephemeral. Whether you visit UnLunDun or one of the aforementioned places – they all potentially fit in the underverse. However, those kids and young beings (monstrous humanoids qualify) that stay too long in the Underverse, ultimately, become Lost Children, represented as a CR +1 template. Particularly if you consume the food and drink there, you’ll be at risk. And yes, this pdf does codify proper planar traits for the Underverse! Mechanics-wise, Lost children gain darkvision, an improved natural armor bonus and a built-in armor bonus that scales with HD, +2 to all ability score modifiers, Ranged Feint…and they get claw attacks and are experts at combat maneuvers, courtesy of their mischievous nature. Protected by misdirection and nondetection with the ability to bed-stride (treestride using beds, with a greater range and the option to bring others along…), they are potent…however, exposure to bright light may have them temporarily collapse into piles of unwashed clothing – for a time. They rematerialize properly, but only when the clothes are not separated! The pdf also includes a sample statblock, a young human lost child unchained rogue that clocks in at CR 5. Editing and formatting are very good, I noticed no hiccups on a formal or rules-language level. Layout adheres to the two-column full-color standard of the series, and Jacob Blackmon’s artwork provided is neat – strong Oliver Twist vibe there! The pdf has no bookmarks, but needs none at this length. Alexander Augunas’ take on peter Pan-ish lost children is really cool. The plane is a great concept, and indeed, the concept can be captivating for adults and kids alike. It’d be perfectly valid to use the Underverse in conjunction with Childhood Adventures – or, if you’re looking to make things more horrific, to scavenge the concepts from DCC’s “Sinister Sutures of the Sempstress” and weave them in. 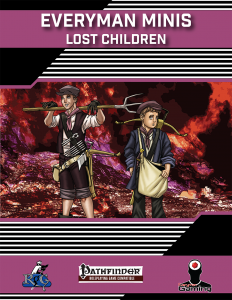 Or to have the PCs, you know, attempt to cure/capture lost children and bring them back to their parents… The contextualization of the plane within a general planar cosmology helps to keep this easy to integrate into your game. That being said, I do have one minor complaint: As written, there is no way to lose being a lost child. While this obviously is thematically consistent with the real world mythweaving that inspired this pdf, it’s still a potential stumbling stone. That being said, I am complaining at a high level here. I genuinely adored this little pdf. 5 stars + seal of approval. You can get these tough kiddos here! Missed Childhood Adventures? While not requried to use this supplement, it’s a natural fit and can be found here! This holiday adventure for DCC clocks in at 30 pages, 1 page front cover, 1 page editorial, 1 page SRD, 1 page back cover, leaving us with 26, though these have been laid out in booklet-size (6’’ by 9’’/A5) in size, meaning that you can fit up to 4 pages on a given sheet of paper, should you choose to do so. This review was part of a request by one of my patreon supporters, to be undertaken at my convenience. Okay, while this IS a module with a strong Christmas-vibe, it also is an adventure that isn’t necessarily for kids – instead, picture this adventure as a scenario that embraces the wild and gonzo side of the Appendix N-aesthetics that inform DCC. Think “Heavy Metal F.A.K.K. meets Christmas” and you’ll have an idea of the theme to expect. The module is intended for level 3 characters, 6 of them, and they definitely should be well-rounded, particularly when it comes to combat capabilities. Having some wilderness-stuff going on should also help. All righty, as always, I’m going to discuss the adventure in detail, so from here on out, the SPOILERS reign. Potential players should jump ahead to the conclusion. All right, only judges around? Great! So, the mighty man that would one day become known as Father Frost, was a humble woodcutter and brilliant artisan, but alas, an evil wizard named Meerakolos (lol) sought to corrupt him – and botched the job. The evil wizard and his associate engaged in an epic spell duel, which Father Frost, ultimately won. When a green-skinned elf from the North freed the ancient evil-doers from stasis, Father Frost never saw their return coming: The arcane weapon mongers have taken Father Frost and use him to power a new engine of war, the Celsion Engine. The adventurers don’t yet know of this alliance of the 3 evil masterminds, nor that the wondrous, snowglobe-like town named Krinnleton is mere days from annihilation. Said town is encased in a force field, courtesy of Father Frosts skills. Speaking of which: Krinnleton is a great place in that it represents a quick and action-packed introduction into the module: After arriving and taking in the strange force-field that holds back the elements, the PCs will be surprised by the initial strikeforce of the self-appointed avalanche lords: Terror tots, basically suicide-bomber wooden dolls, attack – and in this context, it is actually the case that the PCs are rewarded for splitting up. We get full consequences for the actions of the PCs, and the surprisingly neat NPCs are folks you really want to help. In the aftermath of these detonations, the PCs have already reaped the benefits of their actions. The trail leads the PCs to the wilderness beyond the force-field walls, and indeed, the wilderness has some cool random encounters, including polar bearman, strange coyote spirits, and the like – these critters are epic. Snow Angels in particular are a monster that is pretty damn creepy. The overland trek does allow for multiple different routes – but the clock is ticking, as the armies of the avalanche lords proceed towards Krinnleton, and yeah, they can happen upon an army encampment. In Father Frost’s workshop, potent tools may be secured, and ultimately, chances are pretty good that the PCs can gain some advantages for the showdown on the gates of Krinnleton…provided the PCs don’t miss it, of course! The showdown for the future of Krinnleton is epic indeed, as the massive Celsion-engine is led towards the settlement by a pair of wooly mammoths, and once more, PC performance before this part will influence the combat’s difficulty. Ultimately, the PCs will have to enter the mighty Celsion Engine and free Father Frost from the infernal device. The boss-battle here is rather cool, as the PCs are once more rewarded for tactical thinking. Should they succeed, they’ll bear witness to Father Frost ascending to patron-hood! The write-up for the fellow is included, and does come with invoke patron rules, but not the other aspects of what this status usually entails. That being said, I do like the emphasis of Father Frost’s cold being a cleansing, good one – more often than not, cold tends to be associated with purely negative aspects, so a “good” cold patron is appreciated indeed. Editing and formatting are very good on a formal and rules-language level, I noticed only cosmetic snafus. Layout adheres to a 1-olcumn b/w-standard, and the artwork presented is really cool. While we do not get player-friendly maps for all parts of the module, we do get two handout-style maps that the PCs can actually get, which is a big plus. Why Krinnleton doesn’t get a key-less, player-friendly version, though…don’t ask me. The pdf comes with basic bookmarks for the subchapter-headers, but not for individual rooms or encounters. 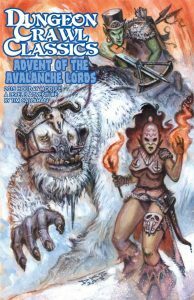 I ended up enjoying Tim, Callahan’s “Advent of the Avalanche Lords” – it’s a scenario that basks in the slightly gonzo magitech-aspect, that revels in its blending of classic themes and the uncommon. I’D hesitate to call this “weird”, as the term has come to signify horror-ish aesthetics in many contexts, and while the module does have scenes that could be taken as being dark, as a whole, it is a module that feels like a light-hearted, fun action-romp. Like, as noted before “Heavy Metal F.A.K.K. meets Christmas” – it is gleeful and honest in its deliberate and fun overthetopness. If the module has one weakness, then that the background story is somewhat needlessly complicated, but that doesn’t really impact y enjoyment of the module. If anything…this feels, at least a bit, like its scope may be a bit off. This may be me, but I couldn’t help but feel that the army-angle could have amounted to a bit more. The module does it well, granted, but in the end, I couldn’t help but feel that a couple of pages more could have really elevated this to masterpiece levels. Still, if you’re looking for a fun, fast-paced Christmas-romp with deliciously outrageous concepts, this will deliver by the buckets. My final verdict will hence clock in at 4.5 stars, rounded up due to in dubio pro reo. You can get this delightfully gonzo tale here on OBS!